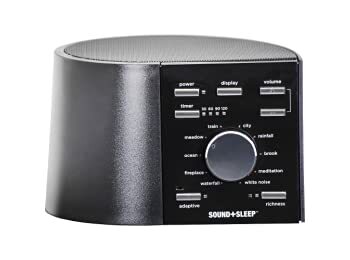 This Adaptive Sound Technologies – Sound+Sleep – Sleep Therapy Machine is a premium quality white noise machine that will help you to relax, sleep, and mask any unwanted sounds in any environment. There are a lot of ways to adjust this and customize your relaxation experience by simply making a few changes to the way the sound is put out. New technology on the device makes it perfect for environments where noise levels vary or change, as it can adapt to any changes instantaneously. WHO SHOULD BUY THIS WHITE NOISE MACHINE? If you’re just looking for a simple device to plug in and forget about, this might not be the one for you. However, if you want to be able to customize your relaxation experience for different times of the day or various situations, this is the perfect device. Anyone who experiences irritation from inconsistent noises will get a lot of benefit from this Adaptive Sound Technologies white noise machine, as it will adjust the level of sound to cover loud spikes in sound. The regular audio tracks can be adjusted to include more richness and complexity. For example, if you set it on the beach sound story you can adjust with a button to add more richness, such as adding a seagull noise occasionally or other beach noises that aren’t included on main track. You can set the sound machine to cut the volume off gradually at intervals of 30, 60, 90, or 120 minutes. Instead of cutting off immediately and potentially disturbing you at night, the sound goes down slowly until it turns off all the way. There are 10 sound settings to choose from, including white noise, rain, beach, and more. As the noise levels around you change, so does the level of sound coming out from the device. Even if there is a sudden spike loud noise, it can be masked immediately once the built-in microphone detects it. Plug in your white noise machine to any standard US outlet in order get power to it. If you want to listen to the sounds from the machine privately without disturbing anyone else you can plug in a set of headphones. Otherwise, you can plug in a set of speakers for louder volume. If the sound card is corrupted or gives any issues, you can simply replace it with another one for this model of sound machine to keep enjoying it. Replacement is easy enough for you to do it on your own. Amazon.com reviews for the Adaptive Sound Technologies – Sound+Sleep – Sleep Therapy Machine are mostly positive with just a few consistent negative remarks. Reviewers absolutely love the rich quality of the sounds produced and the adaptive technology. They don’t like that the volume adjustor doesn’t have an indicator for you to reference or that the sound cards can sometimes become corrupt. Some reviewers stated that it wasn’t even a week of use before their sound cards became corrupt. However, this card is covered by the warranty and can be replaced easily on your own to fix the problem. The volume buttons don’t show you what level the volume is at, but they do work effectively to change the desired volume up or down. The rich sounds that play from this sound machine are wonderful for helping your sleep and relax. This is true sound therapy according to many people who use it! Sounds are more complex than with other sound machines and there is no repetition. Many customers enjoyed the fact that you can add levels of complexity with the richness adjustor. Adaptive technology adds another desirable effect to the machine, as it will adjust the level of sound being produced based on changes in the level of noise in your environment. If there is a sudden loud noise, it will be masked by increased volume in the device until it quiets down again. If you’re looking for a white noise machine with a lot of options for adjustment and very high sound quality, the Adaptive Sound Technologies – Sound+Sleep – Sleep Therapy Machine is a great choice. However, if all you want is a simple plug & play device you should keep looking.